The Pharmacology Guide You’ve Been Waiting For! 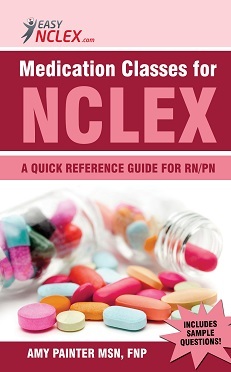 This guide has three sections to help you be successful on NCLEX pharmacology. Each section can assist you by itself, but together they can be an even more powerful tool to improve your grasp of common pharmacological concepts and drugs. With them, you can synthesize knowledge in a way that can increase recognition and knowledge about families or classes of drugs instead of trying to learn every commonly prescribed drug. Starting to learn and recognize roots, prefixes, and suffixes of generic medicine names can help you identify classes of medicines. Typically, a detail that is applied to one drug in that class can be applied to all. We have tried to pick out commonly tested, “gold standard” knowledge points about the different medication classes included in this guide in order to help you be the most successful. This guide is applicable to both RN and PN students. PN students may find that they may not give a certain route of a drug family, but still may care for a patient receiving a drug in that class by a different route. Section 1: includes tables listing common prefixes and suffixes found in the names of generic medications. For example, understanding that -pril is a common root to ACE inhibitors can help you recognize the captopril, lisinopril, and enalapril as ACE inhibitors. We provide a great table in section 1 for common roots names and their associated medication types and examples as above. Section 2: lists an outline of the major drug classes and families. The outline includes a common or “gold standard” medication that can be easily referenced for more in depth study of that class. The way the outline is displayed helps one understand the hierarchy and associations of various classes. For example, this shows the section including hypertension so you can see how AACE inhibitors fit into the big picture. Section 3: NCLEX style questions and rationales on the drugs found in Section 1. This provides good practice for many of the families to be found on the NCLEX. The rationales include many great learning points that may be applied to any of the medicines in that class. We hope this guide helps you to be successful in your studying, competency, and passage of your NCLEX test. Welcome to the nursing profession! 2Checkout.com Inc. (Ohio, USA) is a payment facilitator for goods and services provided by http://www.easynclex.com. The content has been helpful.